We are an English (Steve) / Colombian (Diana) couple in our 30s/40s. 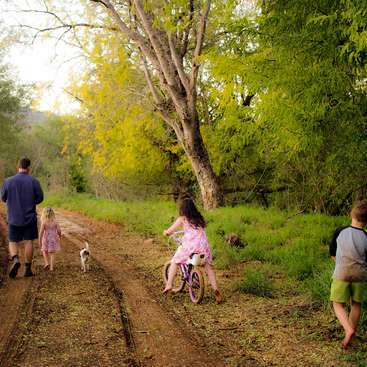 We are privileged to live in our own little slice of paradise, a 7-hectare farm, with spectacular canyon views to one side, and our own accessible patch of river on the other. 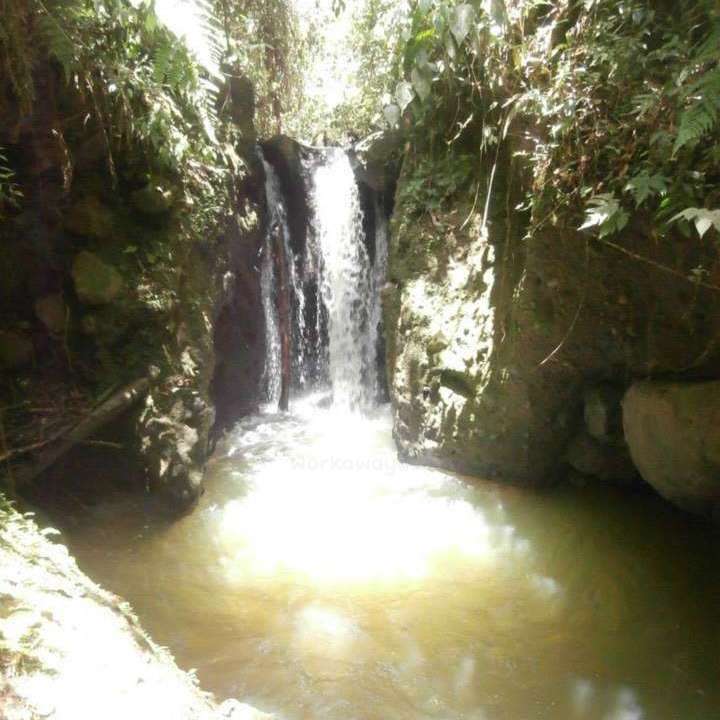 We have our own waterfalls, and are within 10 minutes walk of a series of public waterfalls. We live about an hour's walk from town, taking in breathtaking valleys and small-scale coffee farms. We are working towards achieving food self-sustainability, using the principles of Permaculture to try and reduce our impact on the environment as much as possible. We have taken local courses on organic farming, and are slowly working to improve the soil health. We are trying to adapt our diet to more traditional local foods, including 'Achira', manioc, Plantain/Banana, Sweet Potato, Wild rasberries/blackberries, sweet cucumber, Yota, etc. Our main house is available exclusively for volunteers while we live in a second cottage nearby. We are mostly vegan, though we do buy fresh eggs from our neighbour. Please don't bring meat/fish to the farm. Volunteers cook on a rota basis, and volunteers are also expected to help keep the house clean and tidy. Steve has lived for 15 years in Colombia, first working as a teacher in Cali, then looking to find a more natural, less hectic life in San Agustin around 4 years ago. He enjoys playing the guitar, badminton (we have a net! ), permaculture projects and writing. Diana is a biologist who is involved in local charity work with abandoned animals, and with other local projects. We both work full time bringing up our beautiful 2-year-old girl, who enjoys the company of people who like to make silly faces. We ask for 12,000 pesos per day (3.8 US$) per person contribution to cover 3 meals, gas which is brought by motorcycle, electricity, water, and internet which needs to be faster with more people (and is therefore more expensive). Our income is extremely limited and sporadic, so sorry we have to ask for this. 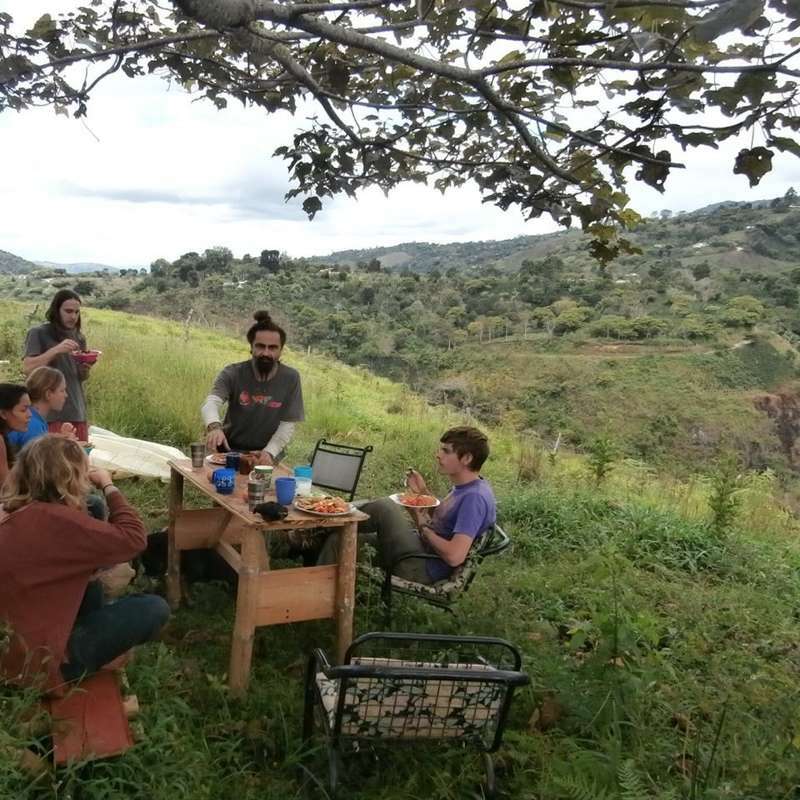 In exchange we can share our knowledge of permaculture and natural building, and you can experience a truly stunning setting with views over a canyon and nature reserve. We really need the help and would be thankful if you could come! We have made some lifelong volunteers friends in the past, and we are happy to share our experiences of living in Colombia / the Colombian countryside. We also have experience of building using bamboo / earth techniques. Though we are still in the learning stages in terms of organic agriculture, we've made some good progress, and have been studying with local experts. We are eager to share our knowledge and listen to suggestions. We conduct daily meditation sessions in the early morning, and are looking to do regular, hopefully daily, yoga classes, taught by Diana or other volunteers. We are also interested in conducting daily workshops led by ourselves or volunteers. The idea is to create a sharing community of learners. At the moment we have 2 single rooms, and the possibility of a dormitory downstairs and potentially another one upstairs (when we finish that room...). 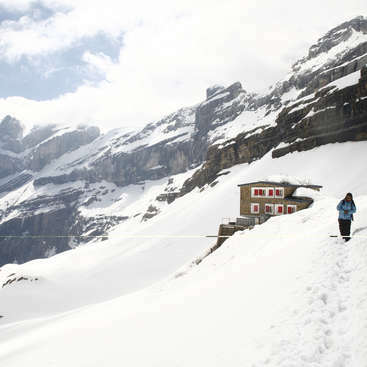 We have 360 degree balconies with views over a canyon and forest to the other side. Though the 3rd floor does not have all its walls, the views from there are even more spectacular. This space is available for camping, and is the preferred option for many. 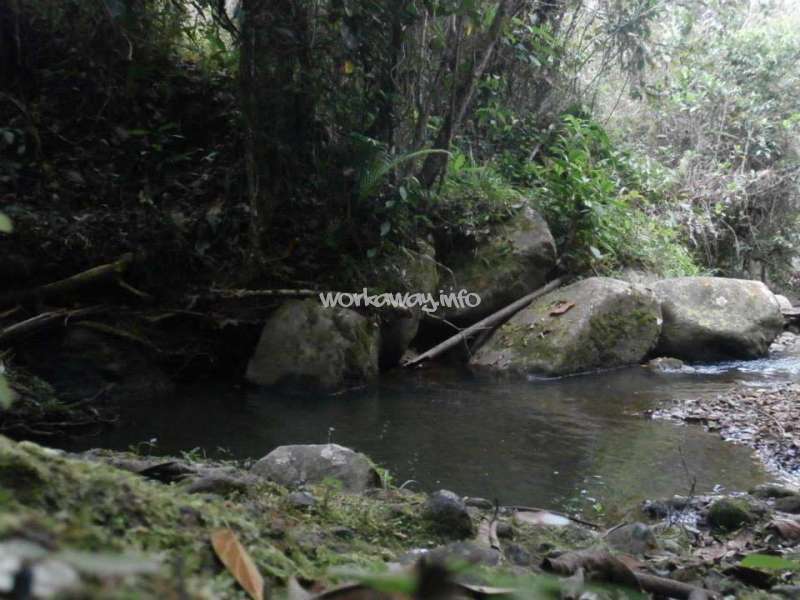 We are located behind the San Agustín archaeological park, in the Huila region of Colombia. We are 15 minutes from the town by motorbike, or an hour\'s walk through beautiful valleys. Motorbike taxi to town costs COP 6000 or COP25,000 by car taxi. San Agustin has a temperate climate, neither hot nor cold. It has the highest concentration of national parks in Colombia, and has a variety of activities for tourists including: visiting archaeological sites (we are within walking distance of the UNESCO World Heritage SIte Archaeological Park and other statues); Horse riding (we can organise cheap tours from the farm); cycling tours; Jeep tours; coffee growing tours. We can rent our motorbike. The town is steadily receiving more interest from foreign tourists, but is still relatively 'undiscovered' when compared to comparable sites in Colombia and South America. Our neighbours still live in a simple, traditional way. You can find locally-produced milk, cheese, eggs, and honey within a short walk from the farm. Our ideology is based on the japanese Fukuoka, which involves learning to live with and observe nature. We are interested in people who want to participate in this project and go back to their roots, to the essence of free nature, less controlled by man. Particularly welcome are badminton players, musicians and lovers of 90s rock, biologists, animal lovers, Vipassana meditators and yoga practicioners, and wanderers looking for an answer to life's contradictions... Also, if you have children you are more than welcome as we have a 2-year-old! Great couple, thanks for the help! Darko was very skilled and able to adapt to different situations. Both were helpful in the kitchen and got on well with other volunteers. Recommended! We had a great time at Steve and Diana's finca! We learned a lot about bioconstruction, ate good food, had good company... One of the best experiences in Colombia. Highly recommended! Greta likes working. A lot. It was great to have someone who had lots of skills and could get on with projects on her own, and explain to the other volunteers what to do. She was easy to have around and got on with everyone. I'd really recommond her, especially for any kind of construction work! Thanks Greta! I spent 2 weeks at this project..
Waking up to have such a perfect place to practice yoga and then working with bamboo and mud. I got to learn new things and share and explore my skills. A chilled vibe throughout the days and great to be a part of and see the project developing. Many waterfalls and statues and hills to explore in time off. San… read more Agustìn is a special town. Much love to this project and the all the people I met there. Thank you Steve and Diana for hosting such a wonderful space. Much luck with everything and maybe see you next time. Enjoy the doors! Davide stayed with us for a month, but, in a good way, it felt like more. 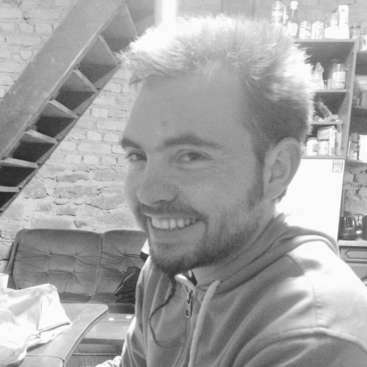 He quickly became a member of the family, and we experienced so many things together, He helped us out of some difficult situations, was really good at organising other volunteers, and had a really good range of skills. We had some interesting and deep conversations. Thank… read more you Davide and I'm sure we'll see you again! To find a place where honesty, beauty and creativity comes together is rare and in this case it was a lifetime experience to share a month with this beautiful family. San Agustin, the Finca, animals, plants and this three beautiful people helped me evolve as a person and gain more skills in many different areas. Enjoy this magical home and get… read more ready for change within. Super chilled, super nice, super helpful... Thanks! Steve and Diana are wonderful people and the location is amazing! Beautiful views of the Colombian hill side as well as being 10 minutes from TWO different waterfalls! I would highly recommend volunteering here. These girls were great and were willing to do their best in all the tasks we put them to do. They got on well with all the other volunteers and were helpful and friendly. Best of luck! Thanks to Diana and Steve for having us! This was one of the best host we have been yet! Because of all the good feedback it is not nessecary anymore to say how amazig this place is. We enjoyed our time a lot at this calm farm and felt home there. It is such a great place to stay! We could helped a bit by buildung new walls in the volunteers house… read more which was quit fun :) If you like the nature and peaceful places just go there! Ross was a friendly guy to have around the house. He was able to get down to any tasks that we gave him and we had some interesting chats. I would definitely recommend him to any hosts! I couldn't have asked for a better first workaway experience then the two weeks I spent with Steve, Diana and Kiya. It was inspirational to say the least. The place is beautiful and I hope to be able to return and build that treehouse :) all the best! Thankyou Steve and Diana and their 4 lovely dogs and loving affectionate kitty. It was an absolute pleasure living in the mountains with this clan for 3 weeks and I will miss those dogs very much. Sorry we didn't get to officially meet, but I feel forever grateful to have lived in this space surrounded by the canyon for this time. Much love. Hope… read more you are settling back in and the pups must be so happy to see you. Victor was a great guy to have around the house. He was very considerate when it came to being quiet for our baby. 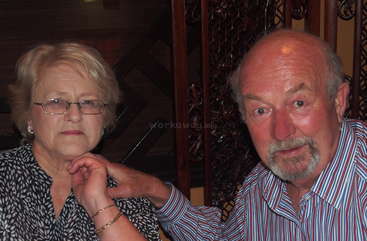 He was always relaxed and sociable, and helped out loads with the tough work we needed doing in our house construction. Thanks Laura for your heartfelt contributions to the homestead. You helped us loads with the walls and became an adobe expert! You were considerate and helpful around the house. You were independent and easy to live with, and we'd recommend you for other family workaways. Good luck! I stayed here six weeks and couldn’t have asked for a better time. Steve and Diana are super kind people and I really enjoyed working for them. I went to South America hoping to be able to paint a mural during my travels and they let that hope become a reality. If you are looking for gratifying work in a peaceful and ridiculously scenic… read more environment then this is the place to go. I stayed with Steve and Diane for ten days on their beautiful farm. I was made to feel so relaxed and welcome, with a very fair workload (if I was feeling tired one day I could opt for less physical work, for example) and delicious, healthy food prepared alternatively by Diana and Steve, or by the volunteers. It was especially nice as we always… read more ate breakfast and lunch all together, creating a close community feel. Also Kiya, their daughter, was delightful. I had some really amazing conversations, met kind, open-minded people and learnt many important things about sustainable living whilst staying here - overall a very positive and inspirational experience. We very much enjoyed having Daniel on the farm and we have his curry recipe stuck next to our fridge still! He was also keen to get involved in work, and interacted well with the other volunteers. I'd recommend him highly! Great place, beautiful location, amazing people, and ideal work to learn and contribute at the same time. I did workaway for 2 weeks and at the end I felt I want to stay longer. I had an amazing experience working on the foundation of the new house. It is inpsiring to see how Steve and other volunteers are using their knowledge, skills and all the… read more information out there in the world to build the house. Went out to check few sites, river, fincas, bamboo forest, and into town to gather some materials for the house while working on the site where the new house will be standing soon. It was a real pleasure and enriching experience to work here. I couldn't have asked for a better first Workaway experience. Steve and Diana have created a truly wonderful home for volunteers to be a part of. Would highly recommend staying with Steve and Diana! DK was an incredibly inspiring person to have on the farm. He helped us make several drone videos and a video on the farm, which he published on his facebook page. He has a huge following on social media, which has helped us to prmote our project. He is very calm, with excellent manners, he is considerate. He loves having in-depth conversations… read more about life and philosophy. He gets on with everyone... Totally recommended especially if you like a bit of philosophy! Steve and Diana are a lovely couple. They are very welcoming, chilled and open minded. We had many laughs and interesting conversations. The work is varied and interesting. Since we only worked in the morning, we had plenty of time to relax or explore the area in the afternoon. Steve, which is mostly the one working with the volunteers, is… read more considerate, fair and always appreciated our help. Diana is sweet and funny, and has the biggest heart for animals. They have a lot of interesting plans for the future, and are always open to suggestions and new ideas. The property is beautiful, with rivers, waterfalls and an amazing view overlooking a valley. The area has a lot to offer, especially for those looking for a less touristy experience or enjoy hiking and spending time in nature. Thank you guys for having me, I hope to see you again and I wish you the very best of luck with the community plans! Had a great time here! Steve and Diana are friendly and easy to get along with, and we felt completely at home on their beautiful farm. Varied and interesting work to do, and plenty of time to relax and explore in the afternoons. We loved going on jungle adventures to the surrounding waterfalls and getting to see Colombia from a new perspective.… read more Steve & Diana treated us and the other volunteers as friends, and enabled a harmonious relationship whereby they were happy for us all to contribute ideas and talk through potential projects for the farm. We often spent the evenings chatting and playing guitar together, and we really feel like we became firm friends with the hosts and other volunteers - we hope to see them all again soon, either in Colombia or the UK! A wonderful family in a wonderful location, and we couldn't recommend them highly enough! Thanks to the whole La Cascada family (including all of the animals) for having us! Micha and Dom stayed for a couple of weeks on the farm, and were always great company. I had some really interesting conversations with them and they were always willing to help out and give that little bit extra, even in their spare time. They were especially helpful with a crowdfunding video, and have agreed to edit it back home, which is… read more obviously well beyond what we would expect from a workawayer. We became good friends and are planning to meet up with them in the UK if possible. These guys are great and we would definitely recommend them to anyone. Mukta stayed with us initially for a week or so to help Diani with her pregancy, as she is a qualified pregancy yoga teacher. She really helped Diani a lot, and was an easy person to have around the house. She is thoughtful, mature and considerate. She was really good with the animals and I would strongly recommend her to anyone leaving their… read more house to someone, as she went on to stay another month or so helping to look after the house with other volunteers. We became really good friends and we still stay in contact with her. A definite 5 star experience for us! It was my very first workaway staying/volunteering. I was so lucky to meet with Steve and Diani, and to stay their beautiful handmade ecohome, in a very nice valley. We practiced pregnancy yoga couple of times with Diani, since we are waiting Kiya and cooked vegan/vegetarian foods. In this point I learned a lot from Diani,… read more cooking different vegan recipes like vegan egg and also some local colombian foods. Also, they were going to vacation and I stayed couple more days in their farm after they left, to look after their pets which are 4 dogs, big jumi, lovely prema, shy tigresa and crazy old purpura; 2 cats dali and yuca and one horse alicia. They are all lovely and easy pets. I never had my own pet in my life, so it was a big mission for me, just feeding them, but they were really nice to stay and sleep next to! I really appreciate to you guys for giving me this chance and the experience of this close relation with them. Very good and shanti energy they have there, all together! And I made very good friends while staying there as well! I first intended to stay at Steve and Diana's for a week, after a month of what was certainly one of the best times of my life I had to say goodbye. I felt at home and very comfortable, Steve was very understanding of my point of view. What a beautiful experience! I met new friends and played music till my heart was content. It was definitely… read more worth the time because I now miss them all, the people, the animals, the food, even Sancocho the rooster. Hope Tina is going well. Say hello to the waterfalls for me. Congratulations on the expectancy! I hope to return one day and catch up and meet the new addition to the family! Amor y Paz amigos:) Hasta Proxima ves estoy en San Agustin. Mukta was a great help on the farm and she taught Diani some yoga positions for pregnant women that we are still using today, really helping Diana with her pregnancy. She is very kind and friendly, and polite, trustworthy. Very good with the animals.... Recommended! We practiced pregnancy yoga couple of times with Diani, since we are waiting Kiya and cooked vegan/vegetarian foods. In this point I learned a lot from Diani, … read more cooking different vegan recipes like vegan egg and also some local colombian foods. Thanks Andrew. You were helpful and friendly, and we were confident that you would look after the house and animals properly. Good luck and stay in touch! This was my first volunteer experience through workaway, and I enjoyed it immensely. Steve and Diana were great hosts, and I learned a lot about eco living and home construction while I was there. The area was beautiful, and I would have loved to stay longer. Thanks again, and congrats on your little one! Agnieszka was friendly and honest during her short stay with us. She was really hardworking and even turned down taking a break so she could finish her task! Carolina was a great volunteer on the farm. She got on really well with everyone. She offered to help with the neutering campaign but we never got our act together in the end which is a shame. She always gave her best with the volunteering work, and helped around the house with cleaning and cooking when asked to. Thanks Carolina! David made a valuable contribution to the farm during his stay. With his friends he made good progress on the road outside, when their muscles had become accustomed to the hard work. They had lots of energy and behaved as would be expected from young guys of their age. To go to Steve and Diana was surely the best thing we could do in Colombia! Apart from all the things we've done ranging from constructing walls to coffee-making and many more cool things it especially was the atmosphere of a very wearmhearted and open-minded community living at a very beautiful place surrounded by nature that made everything so… read more unique and unforgetable. Nathalie and Lucien were our best volunteers so far! Nathalie helped loads with cleaning the house without having to be asked. She spent loads of her spare time finishing off her little project of the room on the second floor. Lucien also dedicated a lot of his own time to helping out. 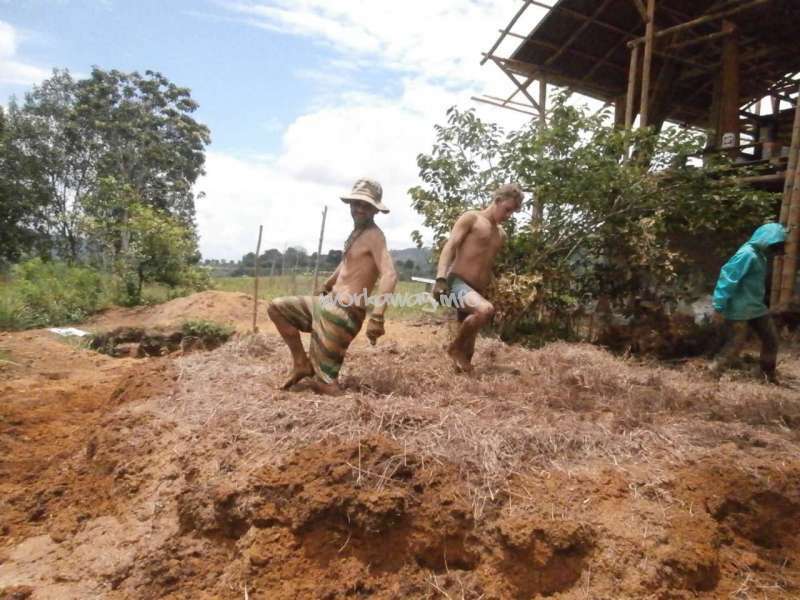 He fixed my angle grinder, and he and Nathalie built a dry… read more toilet practically from scratch using bamboo and wood, adding their own innovate designs to improve my own idea. They are respectful of the host's space, and always help out whenever they can. They are an inspirational couple in so many ways. We became really great friends with them, which was fantastic, because we feel we have made friends for life. I could go on writing, but I hope this is enough for whatever host to accept them without a second thought. Take care guys and PLEASE stay in touch!!!! Hannes and Max were a great help here on the farm. They made loads of progress digging and laying the road leading to our property and didn't need much help in the process. They were good fun, had lots of energy, and generally behaved as you would expect of guys their age. Thanks guys! steve and diana are a great couple that is really open towards their volunteers, they always show a good mood and try to help and inform when they are asked. their property is simply AWESOME with own rivers and lots of nature to discover. we really hope to see them again and especially see the steady improvement on their property. Ah Tom, why did you have to leave so soon? You were amazingly enthusiastic and helpful with everything on the farm and always gave your best. You got on really well with all the other volunteers and we had a great laugh. I'd recommend any other hosts not to hesitate for a moment before taking you on... good luck mate and stay in touch! What an amazing place, with even more incredible people, to share the quickest 2 weeks of my life! Volunteering with Diana y Steve was honestly one of the best experiences of my trip to date...I learnt so much: amazing recipes, poo wall building skills, and can proudly say that myself and a fellow volunteer dug the largest hole this… read more side of the equator!!! really wish you guys the best of luck with the project and thank you both so much for having me!! Marie is a very good person, trustworthy and conscienscious. We very much enjoyed her company, she treated the animals really well, and was a great member of the community in general... thanks Marie! These girls were a pleasure to have on the farm. They helped out a lot with the work and we had some really interesting conversations. I'd definitely recommend them for other hosts... thanks girls! What an amazing couple! Joe and Zara fitted in really well on the farm, They were great with the other volunteers and made a huge contribution to the house. In particular, they painted an amazing mural which they planned carefully first, taking inspiration from several South-American indigenous designs. They had lots of great cooking ideas, have a… read more great sense of humour .... highly recommended! Spend an amazing week at Steve and Diana's place. Work is light and interesting. The surroundings are so besutiful and calm. I definitely recommend anyone going here. The dogs are incredible and food is good. Thanks for a good time Steve, Diana and all the other volunteers! Morten was a great guy to have around the house. He is capable of adapting to different tasks. He's friendly, interesting, considerate and mature. I would recommend hosting him! Olivia and Austin were the best volunteers we have ever had. Olivia is always super positive and supportive, she painted an amazing mural for us and was always helpful around the house. Like Olivia, Austin looked for things that needed doing around the house and did them, withgout having to be asked. This included the construction of a table using… read more bamboo and wood, and even a spoon for the coffee! We were very disappointed to see them go. We would recommend them without doubt to any other hosts! Steve and Diana were kind enough to invite us into their home for a little over a week to work with them and we had an awesome experience. San Agustin is a beautiful area and they live in an amazing spot! They were very kind and generous to us during our time there- cooking up tasty breakfasts and lunches, giving us advice on stuff to do around… read more the local area or just generally hanging out in the afternoons/ evenings. The only downside was having to leave after what felt like such a short time! We would love to come back one day to see the finished project and we will for sure stay in touch and watch the work progress over the next few years! Josh and Jezabel stayed with us for a week or so and were a fantastic couple to have in the house. They helped us out even when they didn't have to, were polite, helpful, considerate, creative, and hard-working, got on well with other volunteers ... I hope they are serious about coming back one day! Kris helped us a lot in the house, transforming the kitchen using his own initiative by building a set of shelves using bamboo and wood, creating something functional and beautiful. He also made us a door, and designed an ingenious system to pull earth from the ground. Steve and Diana are building their dream house in this wonderful region and I'm happy that I've been a part of it. It was really fun to make breakfast together and after a day of working be treated with excellent vegetarian food. Thanks for having me at your place, I had the best time! We only stayed a week with Diana and Steve but we enjoyed every day with them. It was a splendid experience to help them with their most intresting house building and nature project and we felt very welcomed and enjoyed the time with them. They were good, even inspring company and we took a lot of inspiration back home from them. Excellente… read more chicos! Miguel only stayed a week but it was a great experience, he was very conscious of our needs, very helpful, great with the animals, and invented a clever new way of completing our mud walls faster! I could recommend more a workaway volunteer!!!! Muchas gracias amigos por una expedancia hermosa!!! Diana& Steve are an amazing couple with so much ideas on their "finca". I really enjoyed the week on the farm, because working with them is so much fun, and it gives a good feeling. Muy buena gente! Gracias por todo!!!! Julia only stayed a week but it was a great experience, she was very conscious of our needs, very helpful, great with the animals, and invented a clever new way of completing our mud walls faster! I couldn't recommend more a workaway volunteer!!!! Diana y Steve junto a sus animalitos son una increíble familia, me han tratado de la mejor manera. He aprendido mucho haciendo parederes de barro, comida vegetariana, plantas medicinales, pero también aprendí a respetar más a los animales, a comer sano y muchas cosas más. Es un lugar muy tranquilo y lleno de energía y respeto, de San Agustín me… read more llevo dos amigos. Ute why did you leave!?! You are helpful, conscientious, dynamic, good-natured, and a hard worker. Great with the animals. Very autonomous and generally nice to have around the house without being a burden. I'm sure our paths will cross again somewhere! Tenía 3 semanas maravillosas en este finca. Diana y Steve estan super simpáticos y amable. Desde el primero día me hicieron sentirme como en casa, así que el tiempo aquí fue como una oasis de tranquilidad y creatividad durante mi viaje. El trabajo no estaba demasiado fuerte y la comida estaba ricísima. Les voy a extrañar a ustedes y todos los… read more animales ;-)... Hope I will see you again one day! Muchíssima suerte con el proyecto! Greg and Emmie were a massive help in the house. They worked even when they didn't have to! They are a great source of tips and anecdotes, skills and laughs. Thoroughly recommended!! What a great week. Was so nice to be a part of your home and constuction and wish we could of stayed longer . Hope to be back one day. great food really relaxing location. Steve and diana thanks so much for having good us And good luck with everything. We have stayed two months there and now it's hard to say it was only workawaying. All this time that we spent there was an education of life for us. We learned so much and we discovered all things about permaculture and natural life. Furthermore we discovered ourselves as well. Delicious and healty foods cooked by Diana and Steve's friendship and… read more intelligence was unforgettable. This farm became a unique experience with them. Thanks for everything. Quedemos dos meses y ahora no podemos decir que es solo workawaying. Todo este tiempo que pasemos alla era una educacion de la vida para nosotros. Aprendimos mucho y conocimos todo sobre permacultura, la vida natural. Ademas conocimos a nosotros mismos ante todos. Las comidas deliciosas y sanas de los manos de Diana y Inteligencia y amistad de Steve son inolvidables. Esta finca es una experiencia unica con ellos. Gracias para todos. Muy linda experiencia... muchísimas gracias por todo chicos... ha sido un placer permanecer estas semanas en vuestro pequeño paraiso... estamos en contacto, un abrazo! Mario was a great volunteer in the house. 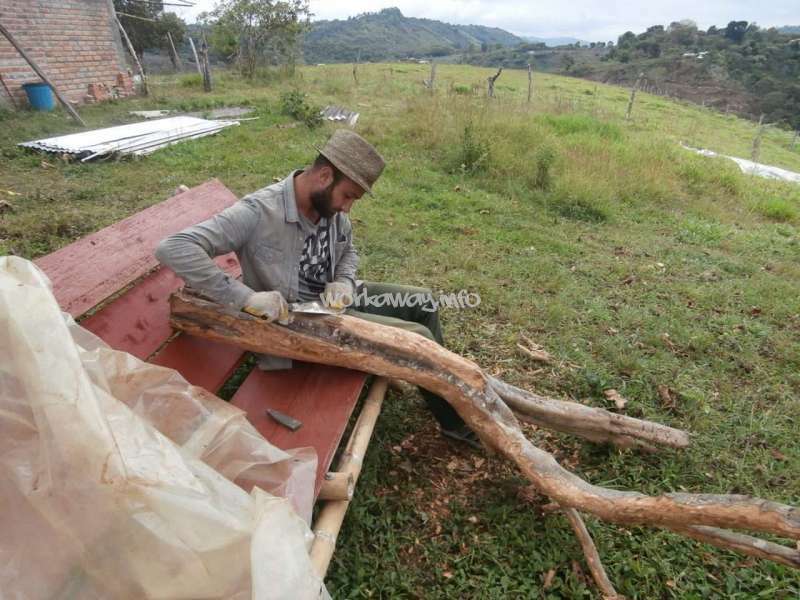 He is very knowledgeable in farming, and helped us a lot with a lot of projects. He worked really hard and we feel we made a great friendship with him. Hopefully we'll see him again!!! Elena was a great volunteer who left us with many beautiful memories. SHe has lots of energy and enthusiasm, and was really handy around the house and the farm. She was always positive, and we are sure we'll see her again!! steve y diana son super. el lugar es super. los animales de la finca son super. Fueron 2 semanas intensas y maravillosas. Gracias de todo :) Hasta pronto!